Senior Architectural Systems, the UK’s largest privately owned aluminium fenestration systems manufacturer, has announced a structured management buy-out (MBO) of the company by its current board of directors. The MBO deal has been led by Senior’s Managing Director Mark Wadsworth (pictured right) and includes three other members of the board – Sales Director James Keeling-Heane, Technical Director Mark Wheatley and Financial Director Les Buxton. Senior’s founder Lennart Jonsson, who helped establish the company back in 1991, will continue as a shareholder and director. 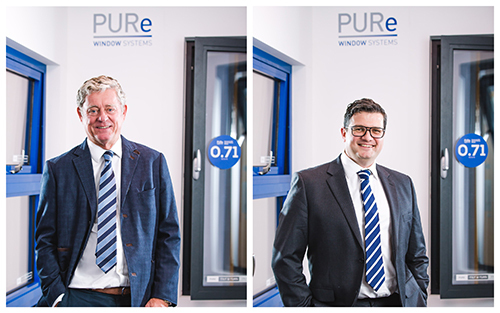 The move marks an important milestone in Senior’s 27 year history, throughout which time the company has consistently been at the forefront of the aluminium fenestration industry. With a strong standing in the commercial construction market and a full suite of aluminium glazing solutions, Senior has invested heavily in the development of its product range and was awarded a patent in 2016 for its innovative low U-value PURe® aluminium windows and doors. The company has also recently made inroads into the domestic residential sector, increasing its market share with the launch of a new range of high performance aluminium patio doors and slim line windows. Commenting on the MBO deal, Lennart Jonsson (pictured left) said: “This is a very exciting time for Senior and I am extremely proud of everything that has been achieved over the last 27 years. The move has been a natural and seamless progression for us. Our goal, as always, is to give our customers what they want, when they want it and the new management structure will enable Senior to continue to do just that.” Senior’s Managing Director Mark Wadsworth added: “Operationally it is business as usual and with the recent addition of our new financial director, the board is stronger than ever. Looking ahead, we will continue to invest to ensure that we not only have the products but also the service that our customers in both the domestic and commercial sector expect.” Based in Denaby, South Yorkshire, Senior Architectural Systems also has operational bases in Scotland and Wales to provide a nationwide service. Employing over 160 people across the country, Senior’s reported turnover for the year ending June 2017 was £30.9m.